Raw milk supporters in cardboard cowheads parade near the R.O.M. in support of Michael Schmidt. 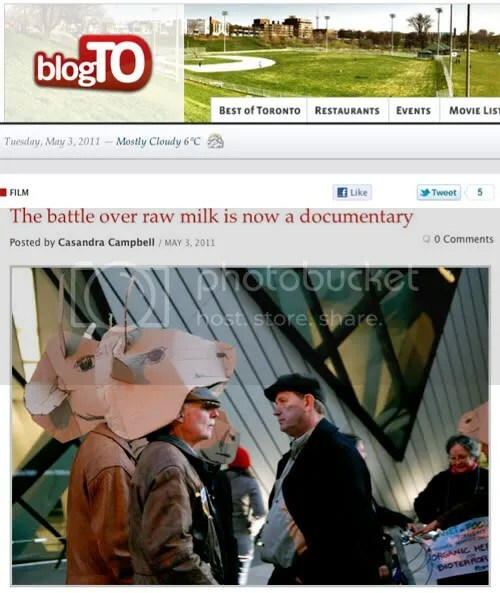 “Milk War, a documentary about the much-heralded organic dairy farmer Michael Schmidt, screened at The Toronto Underground Cinema on Sunday as part of an event to raise awareness about the status of raw milk in Canada. Currently, unpasteurized milk cannot legally be sold in Canada and consumers who wish to purchase raw milk have a difficult time getting their hands on it. Many people, including Michael Schmidt and the producers of Milk War believe this regulation should be changed and are willing to fight for it. Milk War is about their story. Not surprisingly, the event drew a throng of raw milk supporters. Harmony Organics made an appearance handing out free milk and cookies but, as per the current ban on raw milk, everything served was pasteurized. The film itself functions as a kind of expose on the raw milk war that has been well documented by local media.It begins with footage from the raid on Schmidt’s farm in 2006 where his equipment is seized and Schmidt arrested and charged with several criminal offenses for selling raw milk to his neighbours. The doc then contrasts this with footage from post-war Germany where Schmidt grew up. Schmidt’s first memory, we’re told, is seeing his mother stand up to a military tank. This creates a lasting impression – it was a lesson he learned at a young age to not be afraid to stand up for what he believes. In his life today, this means standing up for the right to choose what kind of milk he drinks. Read the whole review on BlogTO.